Tesla has just expanded its UK network of Superchargers with the opening of a store in Birmingham, where Model S owners can charge up their cars for free. Perhaps the most exciting part of this continuing expansion is that Tesla promises within six month the UK network will be complete enough to get you from one end of the country to another, using just Superchargers. That means Model S owners will be able to get form the south of England to Scotland, free of charge. For the uninitiated, Superchargers are the high-power charging stations offered as Tesla outposts. They juice-up Tesla cars with 120kW of power and promise a 170-mile range after just a 30 minute charge time. Home charging will get you a measly 11 miles in the same time. They're free petrol stations, without the petrol. The new charging station is located in the near the centre of Birmingham, just a kilometre away from the famous Bullring shopping centre. Other Superchargers in the UK are found in Edinburgh, Reading, Bristol, while there's a bunch in London: Royal Victoria Dock, Canary Wharf, Tower Bridge, White City and Portman Square. You might be thinking, 'where can I get one?' 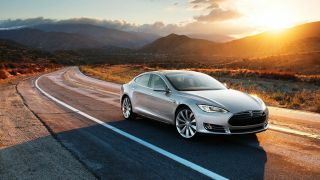 Well, Tesla Model S cars cost upwards of £49,500, making it a bit pricey for a city runabout. Tesla is to release a new vehicle in 2015, the Tesla Model X. It's a larger family car with doors that fold out like those of the DeLorean from Back to the Future. But before you get too excited, the deposit alone costs £4000. We don't know the full UK price yet, but it won't be cheap.